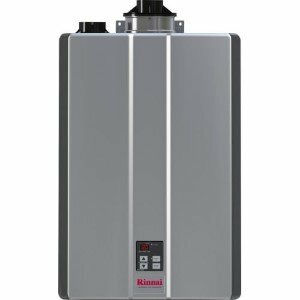 A review of Paloma tankless water heaters from PH-28 or 7.4 series, high-volume and whole-house units, designed to provide endless hot water, almost instant and only when you need it - on demand. With the newest gas features and tankless technology implemented by the manufacturer, Paloma 7.4 models provide high efficient and performing heating. Every Paloma tankless water heater from this group is able to work with the maximum gas input of 199,900 BTU and is considered as the high efficiency, with the energy factor of 0.82 and thermal efficiency of 84%. Except for this low NOx gas burner, an intelligent electronic system also contributes to the unit's efficient and stable operation, while providing a safe environment for its users. 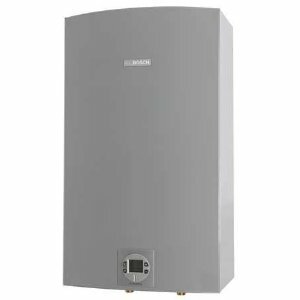 With a gas modulating valve, Paloma tankless water heater PH-28 adjusts its power based on the water flow demand and temperature, so it can work in a range from the minimum 19,000 to 199,900 BTU. The recommended water temperature of 120 F, is factory-set, but it can be adjusted to up to 140 F for residential models. With the 314 gallons of hot water per hour, Paloma tankless 7.4 models are high volume units, and able to provide enough hot water for up to three simultaneous showers and supply middle size residential homes. Use this value as a reference for southern, warmer areas (Sunbelt), where the incoming cold water temperature is 60 F. In northern and colder areas, where the incoming water is 40 F, the supply is 5.2 gallons per minute. In order to start the unit and protect the water heater at the same time, the minimum cold water flow has to be met, which is for PH-28 models 0.66 gallons per minute and the minimum pressure of 14 psi. At the same time and to prevent the inner parts from malfunctioning, the maximum allowed water pressure is 150 psi. The TPR valve, which is a must to install, is designed and tested on that pressure. PH-28R OFN is the Paloma 7.4 outdoor model that cannot be installed indoors and in any other position except vertical. Due to the negative influence of cold weather and freezing temperatures, the recommendation is to protect your tankless water heater by putting proper insulation on both hot and cold water lines. PH-28R IFSN (P) is the Paloma tankless water heater for indoor installation only. For the proper work and safety, an adequate venting system has to be mounted on the heater, with a termination suitable for Category III venting. These indoor models are using a one-pipe system to discharge the flue gases, 4" in diameter, UL approved and Category III stainless steel, while the air for combustion is used from the inside. Fresh air must be supplied through the two equal openings properly sized, either from the outside atmosphere or other room. Venting pipes can be run horizontally or vertically and with an adequate termination. The recommendation is to install a vent with a slight downward slope of a horizontal run and toward the outside so the formed condensate can securely leave the unit. If the downward slope is not possible, or the pipe has to run vertically, then a condensate trap has to be installed. As these tankless models are installed indoor, there is always a potential hazard of carbon monoxide leak. That is why Paloma is using an exclusive sensing burner and ICAD safety system not only to optimize combustion and make the unit greener but to shut the water heater down in a case of the raised level of carbon monoxide. Paloma direct vent water heaters, PH-28R DVSN, must be installed with a 2/4" diameter, UL approved and Category III coaxial stainless steel vent pipe, horizontally or vertically run and with a proper termination. 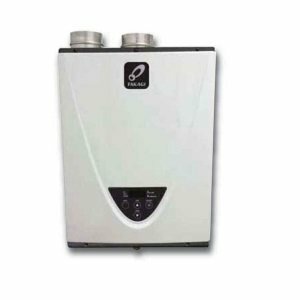 Paloma tankless water heater 7.4 can work as a single unit but can be connected to other residential gas units to gain even more power and water flow. This is done by using the DUOnex Cable that has to be purchased separately. Combining its power, the water supply can reach amazing 516 gallons. When compared to the tank-type units, where one of the models with the 100-gallon tank has a rate of 135 gallons, the difference is significant. The ignition device automatically lights the burner and eliminates the need for pilot light which is wasting energy. It is very easy to use, and together with the built-in electric blower, it helps in an overall increase of the thermal efficiency. Paloma tankless water heaters are also equipped with the computerized self-diagnostic program and error code display, which helps in troubleshooting and repairs. Using the manufacturer's manual and error codes shown on the display, such as 11, 12, 15, you can define what is the possible cause (valve is not open, low water flow, low gas pressure...) and how to repair it (open the faucet to increase the flow, or call the service).